This site is the official source of information about the Thermodynamic Equation Of Seawater - 2010 (TEOS-10), and the way in which it should be used. TEOS-10 is based on a Gibbs function formulation from which all thermodynamic properties of seawater (density, enthalpy, entropy sound speed, etc.) can be derived in a thermodynamically consistent manner. TEOS-10 was adopted by the Intergovernmental Oceanographic Commission at its 25th Assembly in June 2009 to replace EOS-80 as the official description of seawater and ice properties in marine science. A significant change compared with past practice is that TEOS-10 uses Absolute Salinity SA (mass fraction of salt in seawater) as opposed to Practical Salinity SP (which is essentially a measure of the conductivity of seawater) to describe the salt content of seawater. Ocean salinities now have units of g/kg. Absolute Salinity (g/kg) is an SI unit of concentration. 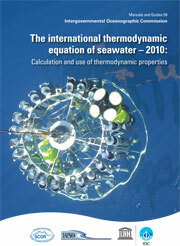 The thermodynamic properties of seawater, such as density and enthalpy, are now correctly expressed as functions of Absolute Salinity rather than being functions of the conductivity of seawater. 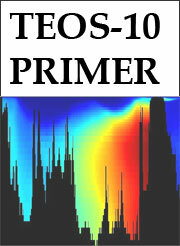 Spatial variations of the composition of seawater mean that Absolute Salinity is not simply proportional to Practical Salinity; TEOS-10 contains procedures to correct for these effects. 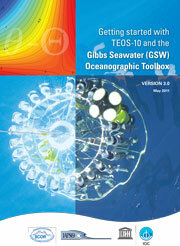 The document What every oceanographer needs to know about TEOS-10 (the "TEOS-Primer" for short) is a concise summary of the salient theoretical concepts which underpin TEOS-10, while Getting started with the GSW Oceanographic Toolbox of TEOS-10 guides the user through the steps required to process and publish physical oceanographic data using TEOS-10. A detailed explanation of the TEOS-10 thermodynamic description of seawater can be found in the TEOS-10 Manual which has been published by IOC, SCOR and IAPSO. 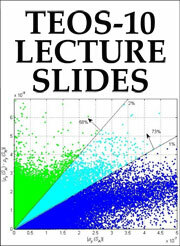 Note that a pdf version of TEOS-10 Lecture Slides is located on the publications page. Importantly, while Absolute Salinity (g/kg) is the salinity variable that is needed in order to calculate density and other seawater properties, the salinity which should be archived in national data bases continues to be the measured salinity variable, Practical Salinity (PSS-78). To avoid confusion while the use of Practical Salinity in scientific publications is phased out, published values of salinity should be specifically identified as being either Practical Salinity with the symbol SP or Absolute Salinity with the symbol SA. Links at left provide more detailed information about publications describing the new approach, and computer codes that implement it.